Plague was not a new disease for London in 1665. In that year it just happened that conditions meant that all was in place for an epidemic: a mild winter that did not massively decrease the rat population as would be normal and a hot spring and summer meant many female rats gave birth to two litters. Hence London as a city was swarming with rats by September 1665. Along with the stray dogs and the many cats that lived in the city, the fleas that carried the plague were easily moved around the city. This combined with the filth that littered London provided the perfect environment for London to be consumed by the ‘Great Plague’. 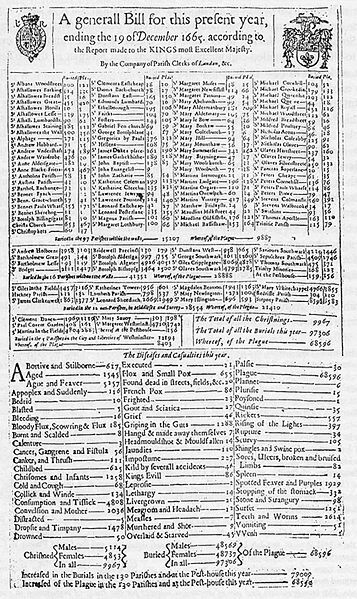 This was the last major outbreak of the plague in England, and the first since 1636, when some 10,000 had died, and 1625, when some 35,000 died (according to estimates in John Graunt's Natural and Political Observations made upon the Bills of Mortality ). In this new outbreak some 75,000 persons are estimated to have died, out of a population of 460,000 at that time, with the poor being hardest hit. In the year 1665 death came calling on the city of London. Death in the form of plague. People called it the Black Death, black for the colour of the tell-tale lumps that foretold its presence in a victim's body, and death for the inevitable result. The plague germs were carried by fleas which lived as parasites on rats. Although it had first appeared in Britain in 1348, the islands were never totally free of plague, but it was like an unpleasant possibility that people just learned to live with while they got on with their business. This time it was different. The Great Plague of 1665 was the last major out-break of the plague in England, and the first since 1636, when some 10,000 had died, and 1625, when some 35,000 died. In 1603, the plague killed 30,000 Londoners. The English outbreak is thought to have spread from the Netherlands, where the bubonic plague had occurred intermittently since 1599, with the initial contagion arriving with Dutch trading ships carrying bales of cotton from Amsterdam. Amsterdam was ravaged in 1663–1664, with a mortality given as 50,000. The dock areas outside of London, and the parish of St. Giles-in-the Fields where poor workers crowded into ill-kept structures, were the first areas struck by the plague. As records were not kept on the deaths of the very poor, the first recorded case was a Rebecca Andrews, on 12 April 1665.